How do my students participate? You can register as a coordinator by going to this website. You can enter as many students as you want to and will retrieve a log-in for them. This way, we can collect important data for you and send you an in-depth report on the results. That includes grades, aptitude and certificates. Just follow the Coordinators’ Instructions; they will help you register. What does my school need to facilitate this challenge? The only thing your school needs is a connection to the internet and some computers or tablets with Windows, Mac or Linux that the students can use to complete the challenge. Who should participate in this challenge? It is recommended that all students in a year group are entered, because one of the objectives of this challenge is to discover aptitude. The small tasks in this challenge start off relatively easy so every student can participate and get something out of it. When will the challenge be held? There already is a practice challenge available for students and teachers that want to know what to expect. 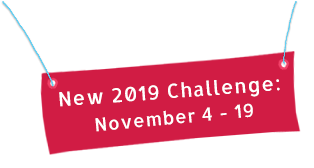 The official challenge will be available for you on any day between November 5 - 18 by clicking on the red button on our homepage or going to Bebras® challenge. Students don't have to prepare or practice anything for the challenge, but there are several easy steps for you to take in order to make the challenge a successful one. Think about how you want your students to enter. Individually, or would you rather have all the information sent to you and enter the students yourself? Then go to bebraschallenge admin. Arrange for the challenge to be held during the two weeks of the challenge. Each participating student will need access to a web browser connected to the internet. It is best to run the challenge on one of the ten days during the weeks of the challenge. If your school has large enrolment and/or limited lab space, you can run it on multiple days. If you decide to do so, please try to limit the interaction between students who have completed the challenge already and those who still have to complete it. Make sure everyone understands the format of the challenge. There are 15 multiple-choice questions. The challenge is graded out of a total of 90 marks: 5 questions in Part A worth 8 points each, 5 questions in Part B worth 6 points each, and 5 questions in Part C worth 4 points each. All students start with 45 points. Instruct students to visit the Online Challenge website and follow the directions listed there. Ask students to carefully provide their name, grade and gender as instructed. Supervise the challenge. The system will give each student exactly 45 minutes to answer the 15 questions. Teachers can provide scrap paper and pens/pencils to students to assist them in solving the problems. Make sure you save the results of every student. That way you can discover aptitude. You can reward the students with a certificate, for example. We have templates available for that. Discuss the solutions with your class. They are available online after participation and give detailed information about the connections to Computer Science. If you want to, you can let the students retry the tasks or try a challenge at a different level. Bebras is registered in the US Patent and Trademark Office.